Is it possible to be a Christian without believing in God? 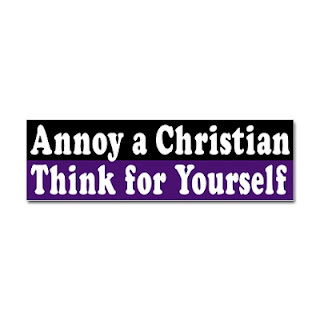 Or, in other words, can one be an agnostic Christian or is that an oxymoron? Before you scoff at the question, take it seriously for a moment. Now, when I say "Christian" I am not taking about someone who is or knows they are going to heaven when they die (although a Christian might very well believe that). I am not talking about someone who believes that someone is listening to them when they pray or who believes that Jesus Christ is the manifestation/incarnation of an otherworldly being called "God." I am talking about someone who takes Jesus' teachings seriously, who may get confused when Jesus says something about God or heaven but nevertheless sees Jesus as someone for whom they desire to give all they've got in order to follow. I am talking about someone who moves toward, with every step, being more like this Jesus and who seeks out communities which might very well be properly defined, by Biblical standards, as the "Body of Christ." Can someone really do that; can they follow Jesus in faith and practice without really believing in God? Or does being a Christian involve mental assent to certain doctrines about an otherworldly being called "God" and/or heaven and hell? Because if you take these things out of the equation and if your definition of "Christian" can include people who aren't sure about much else other than Jesus himself then you can take the question seriously. But if these are essential to the definition and/or if any belief in Jesus himself (at any and every level) must involve a belief in God and heaven, etc. then you may not be able to get far at all with this question before stopping at, "well, no. You have to believe in God to believe in Jesus." But, in order to come to such a conclusion, you'd have to have already taken the question seriously enough to have defined "Christian" in such a way that an agnostic just couldn't fit. This also brings up questions about incarnation. How do you understand incarnation. Is Jesus God or is God Jesus? If your theology allows you to affirm both of those statements then you have to consider that a belief in Jesus is belief in God (even without any presuppositions about who this God is). Therefore God would not be some otherworldly being but would indeed be defined by who Jesus was and is. But if we begin with presuppositions about God, whether they be from the Old Testament or from Greek philosophy (which actually may be where more Christians get their ideas about God than we'd like to admit), and then fit Jesus into those presuppositions however possible (even if we have to say that he had two natures or something like that) then we could not clearly affirm the latter sentiment, namely that God is Jesus. We may still be able to say that Jesus is God but we won't be able to say that God is Jesus. Thus, if your theology does not allow you to define the word "God" with the very life and teachings of Jesus, you probably won't be able to take the question seriously (the one about agnostics being Christians) although, once again, you would have had to have taken the question seriously enough to come to that conclusion. However, if we think of Jesus and allow our very definition of "God" to be defined thereafter we might still have open avenues to allow for someone to be rightfully called a "Christian" but rightfully called an "agnostic" as well ("atheist" might be too strong a term for this discussion). Finally, another dimension of the question involves what we think of Christianity itself. After defining or ceasing to define "Christian" we still have to answer for "Christianity." Is Christianity primarily about theology (by "theology" I might mean "doctrine") and secondly about community? Or is Christianity primarily about community and secondly about doctrine and theology? In other words, does one have to believe to belong or can they belong before they believe? If one has to believe in order to be accepted into the community then it will be impossible for the agnostic to be a Christian even if they wanted to be. They will not be accepted by the church and therefore they will not be practically accepted by God (though they may be in some spiritual sense but we're not talking about heaven and hell in this conversation). so it's no use even asking the question there. However, if you can belong and then believe, if you can join the community, give all you have, and follow Jesus before you fully accept all the doctrines etc. then it's no use asking the question because you'd be asking if your Christian brother or sister is indeed a Christian which is a question made void in its redundancy. You will have already accepted them as a Christian and so the question changes from "are they a Christian?" to "are they right in their theology?" which are two very different questions. The real question is, would someone who is indifferent about God and God's work in the world even want to follow a Jesus who leads them to the cross? Would someone who constantly consumes himself or herself with the question of God's existence ever get around to actually following Jesus? This can be a pointed question more so for Christians than for agnostics. You'll find Christians and agnostics on both sides of these questions. As Christians we should be so consumed by what God is doing in us through Christ that we become agnostics ourselves, not caring whether or not God exists or if we can "know" such things, but moving forward in the hope that God is renewing all things. And we should gladly welcome anyone who dares to undertake such a mission, whether they "believe" it or not. Sounds like D Z Philips, but yes, I think you can be a Christian in such a manner in this current day. My own church holds to the principle 'belong, then believe' If you're stateside, check out the Jesus People. Alastair Kee speaks of seeing in Jesus our Ultimate Concern. Others have spoken of the fact that there is a power for good in the universe, so that certain things matter, like following Jesus. I think the problem is that you are making too hard and fast a distinction between competing versions of 'being a Christian'. Christianity is never, ever, about believing a set of doctrinal propositions, though joining a church may be. Jesus said, follow me, not sign up to me 12 week Alpha course. Starting with Jesus is a very good place; though you might find in time that you take on what he meant by 'God' 'Heaven' etc, which is far better anyway. The main question is, why follow Jesus? Yes, he said some great stuff, and Gandhi rated him highly. But as you say, that road leads to the cross. What really matters in life? What is your ultimate concern? You can as easily go the other way, and make some sort of peripatetic philosopher out of Jesus, a social radical who died for his cause. Why follow him, and not Che? And personally, I wasn't sure I believed in God when I became a Christian. Thanks for your thoughts. I do old doctrine to be very important but you're right that doctrine is not what it's about. It's about discipleship. Doctrine comes second but it still comes, lest we become incoherent about who Jesus really is and why we're following Him. The answer to your question, "why follow him...", lies somewhere in doctrine. If we don't know what God is doing in the world, if we don't see some alternative which is only possible in God also in Jesus, and if we don't believe that there is something better about the cross-bound life of Jesus, then we'd be hard pressed to find anything worth while about discipleship. In retrospect i guess this was a thought experiment, rather than a personal statement, now that I have looked at more posts. Still, I think there is a point to be made that in a society where belief in God is rather vague, and not based on the biblical tradition, belief in God might have to come after turning to Jesus. IOW, do we need people to believe in God before they make a decision about Jesus, or can they find God by being interested in him. If by 'doctrine' we mean teaching, then fine, it has it's obvious place as an explanation of what Jesus is about. To many though, doctrine is a set of statements one is required to believe, and those doctrines are not explanation, they are boundary markers. We hope that people are challenged by what Jesus did and said to want to find out the why of it, the explanation. There can't be a loose, generalised following of Jesus; but as i said, we find, as often as not, that the more we concentrate on him, the more we have to unlearn the content we have put into words like 'God', and find out what he meant. I mentioned Alastair kee, who, in his book Way fo Transcendance, seeks to put the gospel into secular terms. This he borrows Tillich's idea of Ultimate Concern. 'God' for him, is what comes to expression in Jesus as ultimate concern, ie, what really matters in the universe. Great thoughts. I agree. I will have to check out Alastair kee's book now. Thanks. question: How to follow the first century Ribi Yehoshua (ha-Mashiakh, the Messiah) from Nazareth?? I think that the website Netzarim will be of interest to you. It contains logical and scientific research, previously unknown to most Christians, about the first century Ribi Yehoshua (ha-Mashiakh, the Messiah) and what he and his followers taught. His teachings are in accordance with Torah, the instruction manual, of the Creator to humankind. It is an essential read to learn about his teachings! (le-havdil)I would like to put the question: How to follow the first century Ribi Yehoshua (ha-Mashiakh, the Messiah) from Nazareth? ?